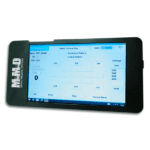 The Mobile B-Scan is MMD’s portable and extremely versatile ultrasound device. 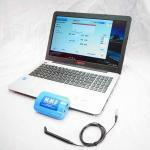 This device turns any PC into a B-Scan device, capable of high resolution imaging. 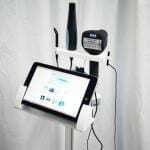 The B-Scan is easy to use with custom settings for multiple applications and a patient database with virtually unlimited size. Since this same probe can travel with you and be used on multiple PCs, it is convenient to operate no matter where you are. 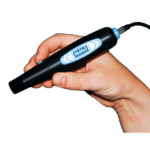 The PalmScan A2000 A-Scan Biometer is a unique device capable of performing both applanation as well as immersion biometry. It does both quickly and with extreme accuracy. The PalmScan A2000 A-Scan is a unique device capable of performing both applanation as well as immersion biometry. It does both quickly and with extreme accuracy. The A2000 makes immersion biometry effortless through the use of the E-Z Tip Immersion Shell and the portable AScan ultrasound. With the A2000, time will no longer be a limiting factor in the office as the device takes only seconds to complete an immersion A-Scan, giving doctors quick results and leaving patients with no mess and no discomfort. 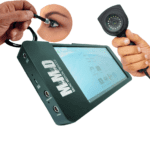 PalmScan AK2000 AScan and Keratometer system is your complete solution for biometric measurements for IOL calculation. This innovative device is a useful tool for eye-care professionals for measurement of the corneal curvature, Axial length, Anterior chamber depth and lens thickness for use in Cataract lens power calculations. 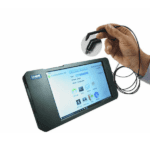 PalmScan AP2000 A-Scan and Pachymeter system combines the of features of PalmScan A2000 A-Scan and P2000 Pachymeter into one, multi-function A-Scan and Pachymeter device that provides surgeons with state-of-the-art tools for success with cataract surgeries – particularly with premium IOL implants. Palm Scan A2000 PRO has new and improved features to help your practice run more smoothly and efficiently. These new features have been received with the highest praise by our new customers and we invite you to experience it for yourself. 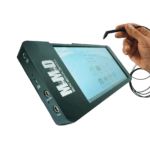 The following new systems have been added to the PRO: additional internal rechargeable battery, probes that require higher power and extend operational time of the system. 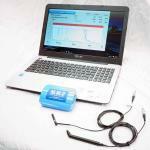 The Mobile BScan is MMD’s portable and extremely versatile ultrasound device. 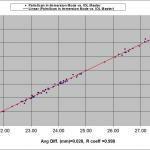 This device turns any PC into a BScan device, capable of high resolution imaging. 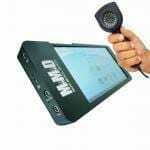 The BScan is easy to use with custom settings for multiple applications and a patient database with virtually unlimited size. 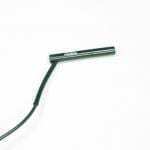 Since this same probe can travel with you and be used on multiple PCs, it is convenient to operate no matter where you are. 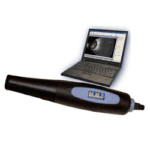 The PalmScan P2000 Pachymeter is an indispensable tool for corneal measurements. 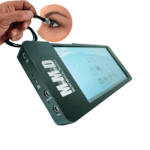 It gives the user the ability to quickly and accurately measure at any location on the cornea. 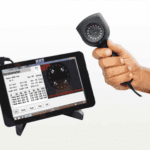 Unlike other pachymeters in the market today, PalmScan allows the users to verify the accuracy of measurements by displaying the measured echogram of the cornea in order to confirm the validity of the measurement. PalmScan AP2000 AScan and Pachymeter system combines the of features of PalmScan A2000 AScan and P2000 Pachymeter into one, multi-function AScan and Pachymeter device that provides surgeons with state-of-the-art tools for success with cataract surgeries – particularly with premium IOL implants. 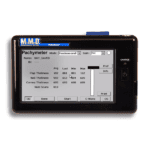 PalmScan K2000 Auto-Keratometer is a new biometry device offered by MMD. This innovative device is a useful tool for eye-care professionals for measurement of the corneal curvature and power for use in Cataract lens power calculations. Replacement 10 MHz A-Scan probe. 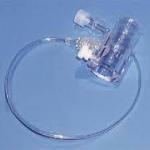 This item is a replacement or a backup A-Scan probe for the PalmScan A2000 A-Scan device.